In the coming weeks, students will ride a motorcycle onto the field at Autzen Stadium. They will fly over the UO campus without going through TSA first. And they’ll do it all from miles away. Admitted fall UO students should start checking their mailboxes around March 14, 2018, and be warned—what is inside is one of a kind. 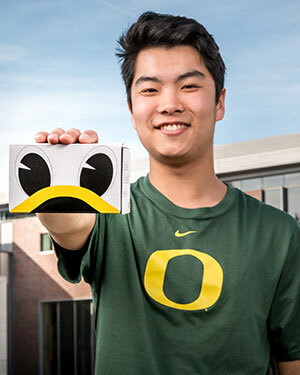 Once incoming students open the Duck-designed box, assemble the Ducks-eye View goggles and download the app at 360.uoregon.edu, their adventure begins. With nearly 100 different virtual reality experiences, students can view nearly any place on the UO campus with a full 360-degree visual experience. Get a duck’s-eye view of one of the most beautiful universities in the country, explore research labs, take a peek into campus life, and have an all-access pass to athletic events. The opportunity is theirs to choose. The project was developed in partnership with Student Services and Enrollment Management and University Communications with one goal; give new students a unique opportunity to experience campus from anywhere in the world. It’s created to be completely immersive with exhilarating visuals and impeccable audio, bringing students directly on campus by donning a little headgear. 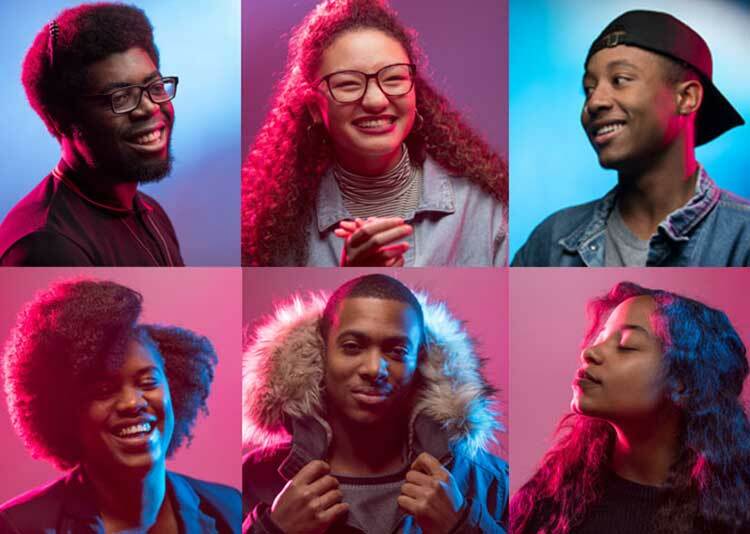 For Student Service and Enrollment Management Vice President Roger Thompson, giving potential students a UO experience is a benefit all the way around. “I am absolutely thrilled with the work the team has done on this project—now every student and their family can experience our campus without having to drive or buy a flight to visit,” he said. 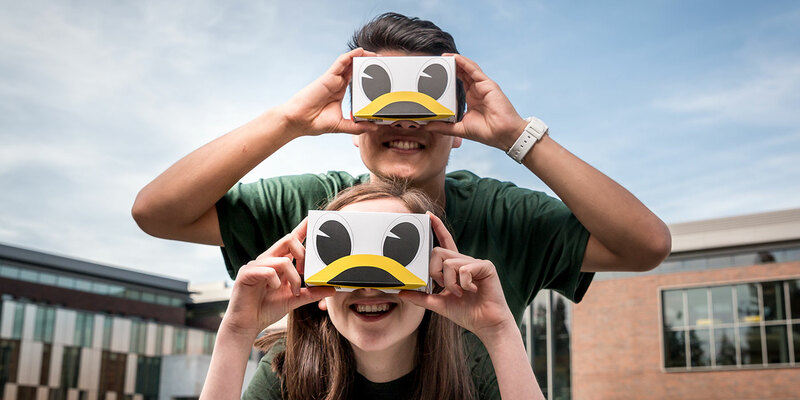 “We also hope after experiencing UO360, students and families will want to come experience the University of Oregon on campus to see what they have experienced in virtual reality and become Ducks!” he said. More than 150 people were involved with this project. 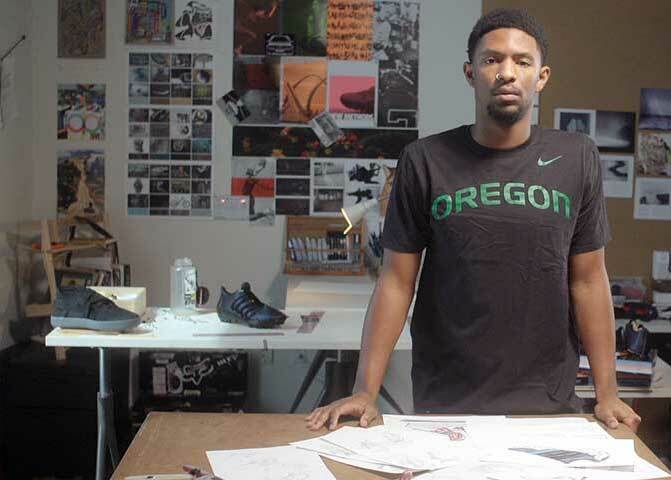 The one-of-a-kind goggles were designed by UO design professionals and their student staff. 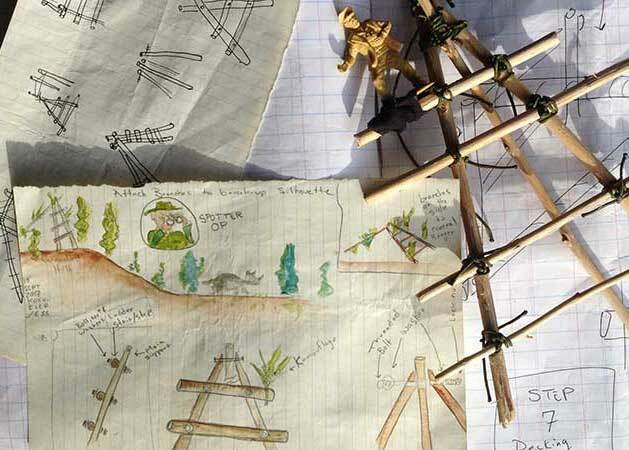 Student worker Hannah Lewman wrote nearly all of the content that leads students on an adventure and helps them choose which options they want to explore first. Travis Kim is leading a team of students appropriately named Flight Crew, who will text and interact with students about any questions they may have about becoming a Duck. They will also serve to guide students though the options that UO360 has as well. Portland-located 360 Labs created the app, where some of the video editing was performed by a UO alum Rachel Bracker. In addition, the EMU Craft Center lent many hands in creating a VR headset for the Oregon Duck, an exact replica of those that students are about to receive, down to the graphics and operating button. The University of Oregon is the first institution to bring their campus to prospective students in this way. While the goggles will be arriving in mailboxes soon, any virtual reality headsets for smartphones can pair with the UO 360 VR app. Get ready to pick your jaw up off the floor. All across the country, prospective UO students are in for something extraordinary when they receive their VR goggles and download the 360 app. Just ask the UO student who wrote all of the corresponding copy and stories that will guide viewers through the experience. 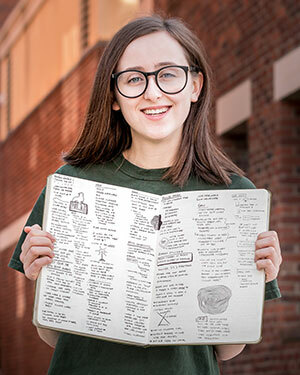 Hannah spent her winter break researching all aspects of campus before sitting down to write every single word that appears throughout the entire experience. A student director at Allen Hall Advertising, she was joined by Travis Kim, also a codirector at the student-run advertising agency. Travis heads the Flight Crew, a team of students who will be texting if viewers have questions, need assistance, or want to know which UO VR adventure to embark on first. Originally from Hawaii, Travis remembers his first visit to UO and how shocked he was. “I couldn’t believe how tall the trees were, and the scenery was just incredible,” he adds. Now, students who aren’t able to make the journey for a campus visit can experience the same thing Travis did—but from the east coast, the southwest, and even his home state of Hawaii. Hannah, who grew up in Portland, agrees. “You can’t get that in a brochure,” she laughs. Although hard-pressed to declare a favorite adventure on the 360 app, Hannah was surprised how much she liked the Autzen stadium option, in which the viewer gets a real sense of what it’s like to ride on a motorcycle onto the field during a football game. While testing out the VR goggles for the first time, both were struck by the clarity of not only the visuals, but the auditory sense as well. The opportunity that both Hannah and Travis had to work on the project was invaluable, although it meant keeping a big secret. “We wanted to tell everyone about it,” Travis says as Hannah nods. 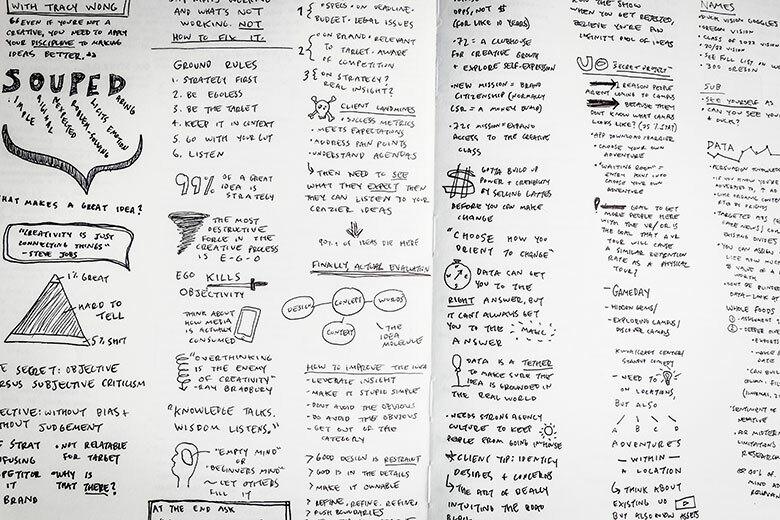 For Travis, the project made him more aware of the rapidly changing communication landscape, and how he, as a communicator, can adjust to the changing technology moving forward.